How to create a tent wedding in your backyard? A warm backyard wedding will make the wedding atmosphere more intense. It is very convenient to hold a wedding in your backyard no need to book the venue in advance. The backyard wedding is perfect for couples who like the outdoor environment and want to enjoy the private spaces. But it’s not easy to hold a tent wedding in the backyard. Here are some suggestions for how to create a tent wedding in your backyard. The first thing is to confirm how many guests at a backyard wedding. For example, a wedding for 100 people can use a 10x20m wedding tent. Accordingly, you need to have enough space in the backyard to build a tent. Our wedding tents can be built almost any sites, and our clients had built wedding tents on the edge of the pool in the backyard. Of course, you can choose where ever you like. We provide many sizes and shapes of wedding tents. If you want a rustic look, you can choose the A-frame structure tent for a wedding. If you want a romantic space, you can choose a glass wedding tent. If you don’t like the rectangular structure, you can also choose to hold a wedding in a geodesic dome tent. 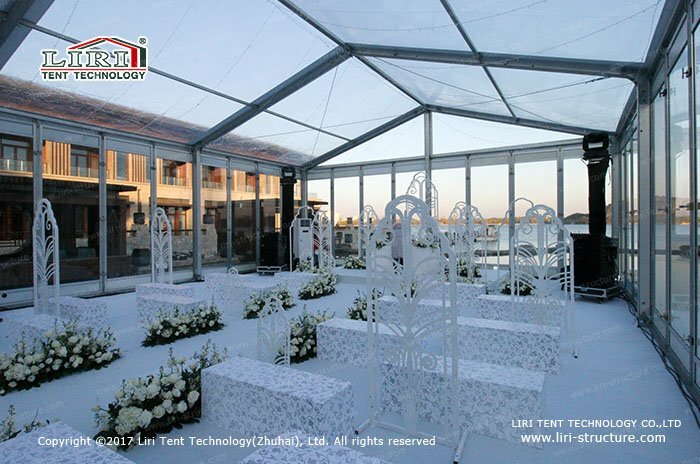 In addition to the external structure, various interior decorations can be done within the tent. You can decorate the tent with a floor on the grass area and ceiling cloth and hanging chandeliers. There are many ways to turn a wedding tent into a dream wedding venue. As everyone knows, the weather will definitely have an impact on the wedding event. The advantage of using our wedding tent is that you don’t have to worry about the rain, wind and other bad weathers that will affect the mood of the guests. 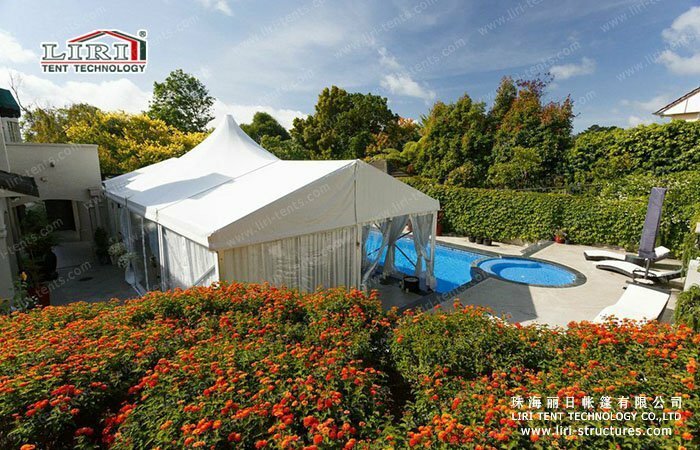 Our wedding tents are made of double side PVC-coated waterproof fabric that is effective against rain, sun, and other weathers while high-strength aluminum alloy frame material can resist big winds. But the weather is still a factor need to considered when you are holding a wedding. For example, when the temperature is high in summer, you need to consider applying air conditioning in the tent. In the high winds weather, you need to consider using four surrounding curtains or glass walls to block the strong winds. In addition to the wedding tents, some small pagoda tents can be built in the reception area and the passageway. The power issue is also one of the most common problems. All kinds of equipment in the tent wedding require electricity, such as stage effect, lighting, and air conditioning. In general, the power supply capability in a private home is not enough for these devices, need an extra power supply or generator to supply power. These are some of our suggestions for holding a tent wedding in the backyard. If you have other wedding tent questions, please kindly contact us for more solutions and suggestions.